As some of you might remember from last fall I had the opportunity to take a young lady turkey hunting in the fall along with her father. 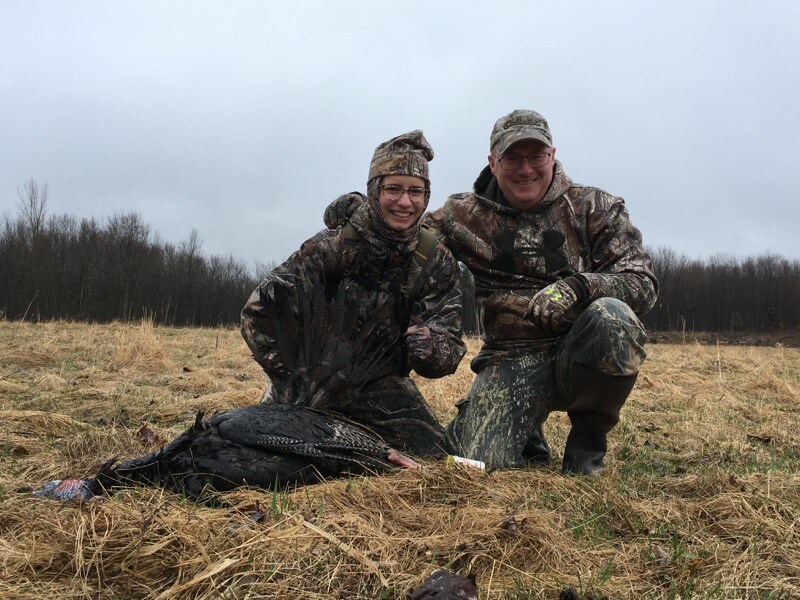 This spring her twin sister Lily joined us for what would be her first turkey hunt.Opening day saw Lily and I on one of our favourite spots overlooking a large hayfield at an intersection of several fields. 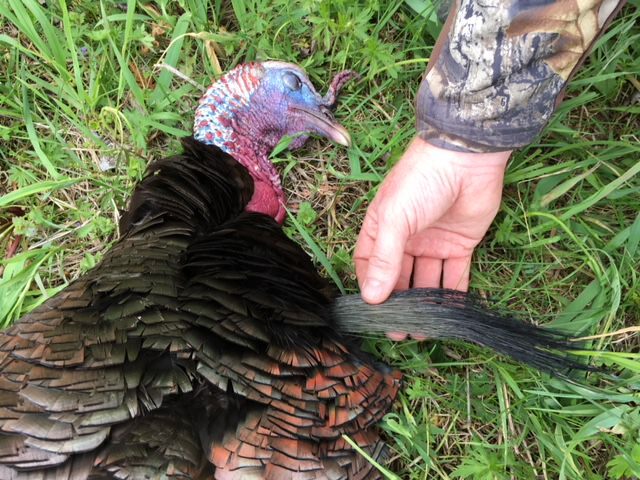 The gobblers were on fire opening morning despite the rain and overcast in our area, then they became silent and we were left with the noise of the rain on our blind and very little action. It seemed a little disappointing that we weren’t seeing any birds as this has long been my go to field for Toms. I actually began formulating a plan for the afternoon hunt, when Lilly spotted a Tom coming from the right side of the blind to check out our decoys. She slowly started to raise her 20 gauge for the shot when the Tom (which was aboutten yards out) spotted something he didn’t like and I desperately willed her to shoot before the Tom left for sunnier climes. She pulled the trigger and she had her first Tom. I was thrilled to bethere for her first bird! The next weekend saw us divided up on different properties. 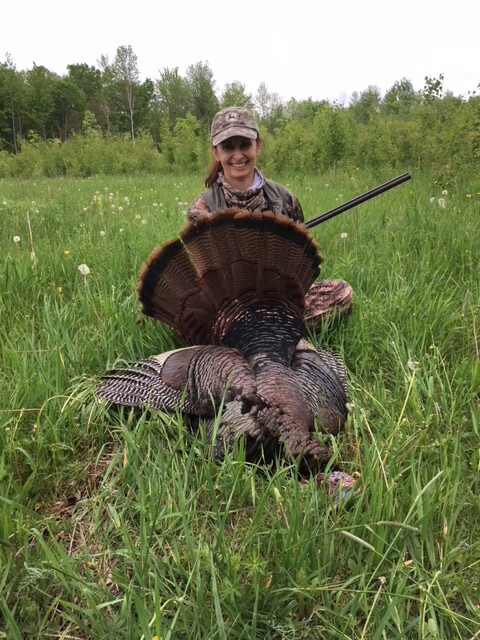 Abigail (who was now a veteran turkey hunterfrom last year) was teamed up with her father in the same hay field and experienced the same start as the previous weekend with lots of gobbling andthen silence. The field remained largely empty except for a single Tom who skirted the far side of the field just inside the wood line, remaining immune to calls from my army buddy as he obviously had a hot date somewhere else! Unbeknownst to them two Toms and some hens were making their way towards the decoys fromthe left of the blind. They came inquiet just as last week and once they were in the clear for a shot my army buddy had gotten his Tom. 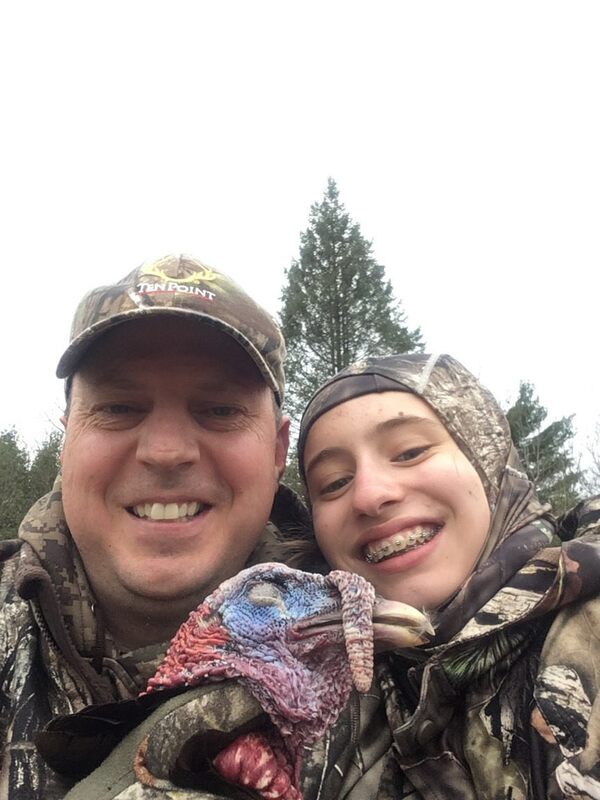 A father/daughter selfie was taken by the happy hunters. I decided to hunt solo at another location which was in the centre of our woodlot during the afternoon of the second weekend . Gobblers had been heard there the week before but as of yet none had made their appearance. True to form I saw three lone hens each about an hour apart as the afternoon wore on. Once the last lone hen had drifted away from the small clearing I made a quick call and was immediately answered by a gobbler directly in front of my blind and I started to strain my eyes through some thick undergrowth when a lone hen pops out into the edge of the clearing and heads for the decoys. I instantly see the Tom behind strutting away and think to myself great as he will follow the hen in. Of course he doesn’t,and continues strutting in the woods just out of range due to the undergrowth(you can bet I will fix that this summer). The hen loses interest in the decoys and moves off to my left and I can see that the Tom is about to follow her off into the woods. I see one small gap where I can get a shot if he passes through and concentrate fully on this spot.He continues to side step the small brush clearing but edges closer to the laneand then into it where the old adage “its now or never” resounds in my ears and I pull the trigger and down he goes! The next morning of the second weekend finds me calling for my better half, she had hunted this same two acre food plot full of clover last weekend and had hens all around her but had not seen any Toms but had heard them calling. The morning starts off slow with a few Toms gobbling back but at quite a distance. My calling doesn’t result in any interest from the local Toms and we settle in for the long haul. A doe wanders into the food plot and provided quite a bit of entertainment as she stomps repeatedly at the decoys. I am just about to let out a hen yelp when my better half says “there on the left, two Toms” in a whisper to me. The first Tom isn’t buying the decoy set up and cuts straight across the food plot, but the second commences to strut and work his way towards the decoys. She slowly raises the Verney-Carron O/U and waits for him to get closer when the Tom loses his nerve and decides to get out of Dodge. She senses he isabout to retreat and shoots putting him on the ground. All in all a great season for us so far! Last edited by KMG Canada; May 10th, 2018 at 09:52 AM. Congrats to all of you on your nice birds. Thanks. Two of the properties we hunted above were really covered with birds this year. Keeping the predators in check and some land management seems to be finally paying off. Well we managed to head out one last time this past weekend and after scouting through the previous week we focused on a large hayfield and a small clearing in some cedar bush. Abby and her father went to the small clearing and Lena (new hunter and mom of Lily and Abby) went out with me to the hayfield. We had Sat afternoon and Sunday morning to hunt. Upon arrival at the hayfield on Sat afternoon we heard a tom gobbling as we quietly slipped into a blind at the edge of the field. I let out a couple of calls and could not get him into a conversation no matter what I tried. I settled into calling periodically and the tom went silent. Several hrs passed with nothing but mosquitos to look at, when without any noise at all a tom appeared to the side of the blind headed out towards our lone hen in the hayfield. Lena slowly got into position and ever so quietly raised her shotgun up inside the blind as he was only out about ten yards. The tom suddenly figured out something was amiss and stretched up straight and tall looking like he was about to bolt any second. Lena pulled the trigger and her first tom was on the ground. Unfortunately Abby didn't connect, but there is always next season! 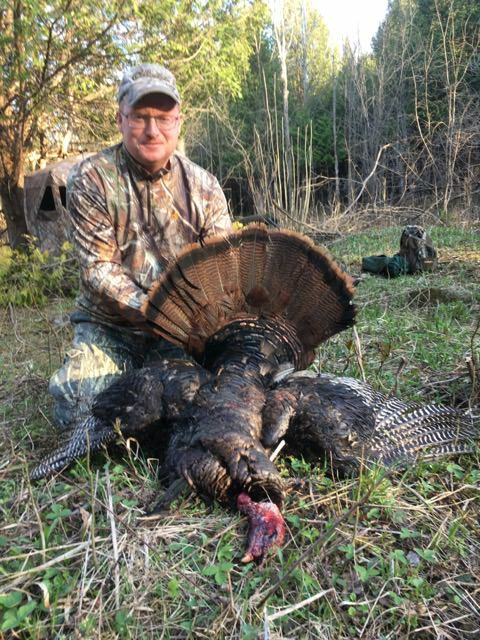 Great recap of a great season KMG, hope everyone is now fully infected with the turkey hunting condition we all have? 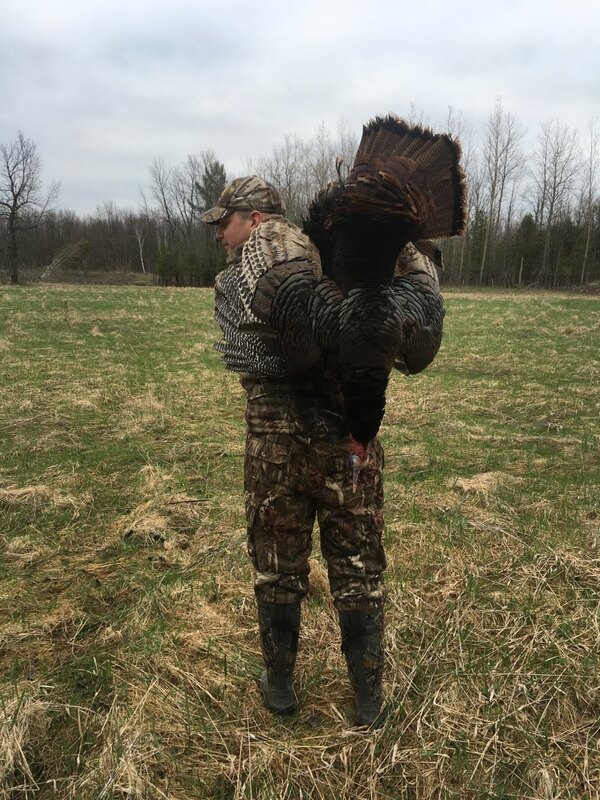 Hopefully we have some new converts to turkey hunting, hard to believe I was helping to release them thirty years ago, never thought we’d be hunting like this!